Earlier this year, we threw out a challenge to all our robot makers to BUILD A SOLUTION to an everyday real life problem - and that's exactly what they did! We received many outstanding projects which really showcased their wit in coming up with creative and innovative solutions. Good job, rero Robot Makers! Thanks for putting in so much effort. Regardless whether you win the cash prizes or not, you're already a WINNER for taking up the challenge. We hope that you do not stop here but continue to build more amazing robots and improve your programming skills. 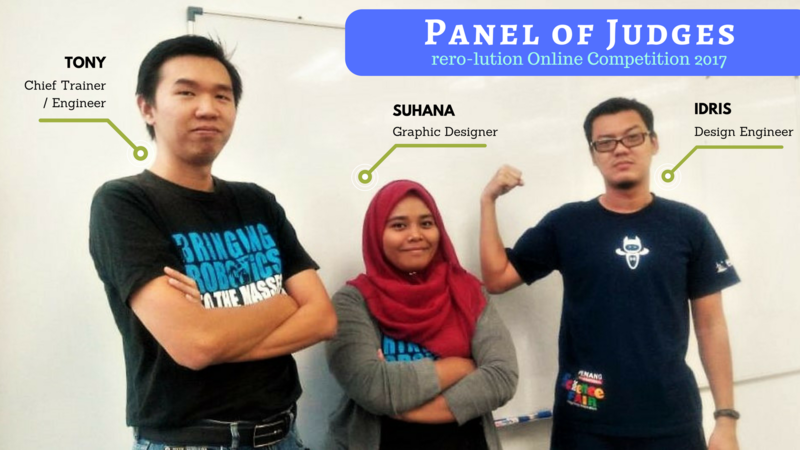 Before we announce the winners, allow us to introduce our panel of judges for this competition.... *drum rolls*... Special thanks to Tony (Engineer and Chief Trainer), Suhana (Graphic Designer) and Idris (Design Engineer) for reviewing EVERY submission to decide on the Winners. All projects were judged based on the following criteria - (i) Creativity and Innovation, (ii) Engineering Design, (iii) Programming, and (iv) Video Presentation. Total points awarded by the Panel of Judges were converted to 70% and the remaining 30% came from social media voting. And here's the final result for rero-Lution Online Competition 2017. If you are interested to view all project videos, please head on to our YouTube Channel playlist here. CONGRATS once again to all Winners. See you at the prize giving ceremony at RAC'17 @ KLESF, The Mines in November!